Life, The Universe and Sculpture. Q How long have you been living here? A Ten years, or thereabouts. Q Was it always your original idea to live here and have a studio? A I have always wanted to live in Greece – all my life. It was only a few years ago when it seemed viable. Q What made you choose Kritsa? A It is a village both proud of being traditional and also very keen to invite visitors and tourists – it has a lively tourist industry. And this opened up possibilities for me to earn a living as a sculptor here – provided, of course, I kept my ideas for sculptures accessible, not too weird! Q Since you came ten years ago, what major changes have you seen? A Greece is in crisis and a lot of shops are struggling now and some are closing – including my own. The tourists don’t spend as much and overheads get higher and higher as new taxes are introduced – hitting small businesses very hard. Q How do you earn a living as a sculptor? A For the first eight years here (with my partner Jenny) I had a studio gallery. I made small sculptures for sale in limited editions, and this led me to getting a number of quite large commissions, from both private and public patrons. Slowly my reputation grew. I closed the gallery shop one year ago. Now I work mostly on commissions, though still producing some limited edition pieces. Q Let’s move on to your most recent commission. 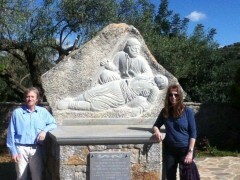 A A few years back I was asked to carve a large stone relief commemorating the death of Rodanthe, the “Kritsotopoula”. I felt very honoured and proud that the village chose me to make this as it is about the village heroine. There is a very large epic poem that tells of her story, how she fought dressed as a man against the Turks in the 1820s, and died. It’s a wonderful story. 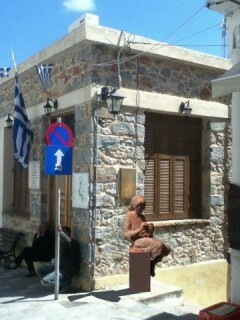 More recently my current commission is a gentle piece which will stand in the main street of Kritsa. 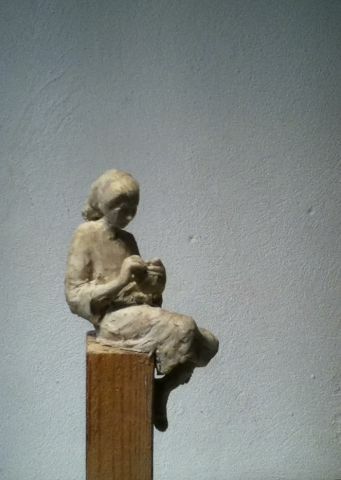 It shows a young girl from the past working on ‘Plekti’, a Cretan traditional form of crochet. Q Why such a modest figure? A I wanted something people would feel affectionate towards – something intimate. “To Nima Tis Zois”. trans. “The Thread of Life”. The great long continuity of Kritsa. The ladies have been doing traditional crafts for 100s of years. In the difficult situation Greece is in – it seemed a big monument would be out of place. It is now more a time for the personal, to honour the smaller things in life, the day to day. She’s about 11 or 12 and just beginning to do the traditional women’s work – I tried to show from her expression that on the one hand she’s very keen to be doing proper grown-up stuff, and trying to get it all right and, on the other, that she’s also thinking “I’d rather be out playing with my friends“. Feeling grown up and still playing… a little like Greece in a way: it’s both the oldest country in Europe – it’s lent its culture to the whole world – but in another way it’s the youngest and having to grow up fast. Q OK, could you tell us something about the materials and processes you use for your sculpture? A My favourite material is marble – but I also like working in wax – modelling in a small scale in wax. For the “Thread of Life” I began with a sketch maquette in wax, distilling aspects of 10 or 12 girls from the village into one image. There are aspects of all of them in it. When it came to working on the full scale sculpture, I first made an iron armature. I take a lot of time and trouble making this as a lot of the mood and essence of the piece comes from the armature: it gives the gist of the pose. This is then padded out with squirty builders foam, which I carve back to a centimetre or two below the intended final surface of the sculpture. It looks a bit like a Sci Fi alien at this stage. I then add clay and the real sculpting work begins as the modelling becomes increasing detailed such as the facial features. I have to ensure that the clay is damp at all times, I spray it every few minutes, which is the hardest bit about using clay in a hot country like Crete. Then I make a silicone rubber mould, in this case quite a complex ten piece mould. The rubber takes the shape and then I add either a fibreglass or plaster jacket to keep the rubber mould in shape. The final material will be fibre glass resin with maybe a bronze alloy filled resin (cold cast) metal dust and add it in equal quantities to the resin. It behaves very similarly to foundry bronze at a fraction of the price. Or I might add other things to the resin to make it look like terracotta – but it has to be strong, I can’t use real terracotta for this sculpture – it’s in too vulnerable a position so the material must be strong! Q Do you think there might be a culture trail to show the Kritsotopoula’s story? A Nikos Massaros, one of the descendents of the Rodanthe’s family (not a direct descendant – she died a virgin) has inherited the family house. It is now being restored as a museum, by recreating her house with the intention to link up the various bits of the story, between the monument which is situated at the battle where she was mortally wounded and the house where she grew up, the family house and another village where she was taken to by the Turks. A book is also being written which will tell her story. In some ways, my new sculpture will fit into the story too. Though the girl can be seen as every Kritsa woman, she can also be seen as a young Rodanthe, returning from the monastery, where she was educated as a young child, to begin learning the traditional female skills from her mother. But even then she made it clear she was going to do things her way – she is a feisty woman! THE STORY OF RODANTHE, THE KRITSOTOPOULA. In the early 1820s, during the first great revolt against the Turkish occupation of Crete, the young Rodanthe, daughter of the chief priest of Kritsa, was working at her loom. And as she worked she sang. The local Aga fell in love with her voice and sent out his henchman, who kidnapped her and murdered her mother. Brought to the Turkish camp, Rodanthe was stripped of her Cretan clothes and prepared for marriage as a Turkish bride. Alone with the Aga, she seemed to give in to necessity. “But your weapons frighten me,” she told the bridegroom, “take them off, undress and I will lie with you as your bride.”. But the moment he lay down, naked and defenceless, she snatched up his dagger and stabbed him to death. She dressed herself in his clothes and armed herself, fleeing unnoticed through the camp – the soldiers were so far gone in their celebrations that they failed to notice. Indeed, they went on failing to notice for three days, believing their lord was having a great honeymoon… and then from his house out ran a dog with a human hand in its mouth! They swore vengeance and the war escalated. Meanwhile, in great sorrow, Rodanthe knew she could not return home while her mother was unavenged and her own reputation was destroyed. She cut off her hair and dedicated it to the Virgin Mary, forsook her girl’s life and, disguised as a man, joined up with a troop of Cretan rebels. At first they did not think much of this slight, beardless boy – “Beardless Manolis” “he” said his name was – but soon the young recruit proved himself the fiercest fighter in the group. Rodanthe fought harder than any man. At last, in 1823, a great battle was fought between a large Turkish army and the combined forces of Cretan rebels from all over Crete. Rodanthe fought bravely and found at last the man who had slaughtered her mother. She had her revenge and killed him in combat, but then she herself was grievously wounded in the breast. She was taken to the doctor’s house. By a divine coincidence, her own father, who had become one of the fighting priests of Crete, was also wounded and taken there. It was only when the doctor opened up the young warrior’s shirt that they discovered at last that this was no youth but a young girl! At last she broke her silence: “ I am your Rodanthe,” she told her father and with her ebbing strength told her tale, and how she remained pure. Then she died, and her father – who had recovered his daughter only to have her snatched from him again – died also, more from grief than from his wound. But the people of Kritsa all honoured them as heroes, and with a great funeral, father, daughter and mother were laid to rest together again at last. Interview Â© Jane Ostler / Nigel Ratcliffe–Springall 2013 All rights reserved.